Bars and counters are my favorite places to sit in restaurants. There’s something about the combination of close proximity and food that fosters great conversations among complete strangers. And, if I see you sitting next to me with a book, you won’t have time to read it because I’ll won’t be able to stop myself from asking what you’re reading, what it’s about, and do you recommend it. Mass., (on Cape Ann, about an hour north of Boston) while I was researching my book, Off The Beaten Page: The Best Trips for Lit Lovers, Book Clubs and Girls on Getaways. There was still a chill in the the air and we were happily slurping down huge bowls of fish chowder at the Red Skiff, a tiny restaurant on Rockport’s aptly named Mt. Pleasant St. (The relaxed pace and the chance to hang out and chat with locals on both sides of the lunch counter without a line if diners behind you, and of course lower prices, are a few of the many charms of off-season travel.) I noticed that two of our lunch counter companions were discussing a book, so I had to barge into their discussion and ask about it, which led to questions about where we were from and what brought us to Rockport. Turned out the two gentlemen were members of the local sheriff’s department enjoying their day off. 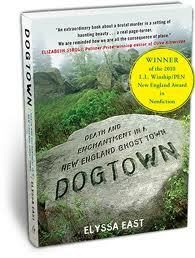 When one heard about my project, he grabbed the book from his friend’s hands and said, “You’ve got to read this book.” It was Elyssa East’s Dogtown: Death and Enchantment in a New England Ghost Town. He said with an air of mystery that Dogtown has had a very strange history. “Say no more,” I said. 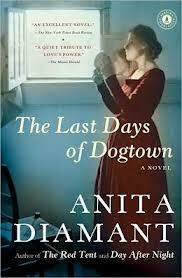 Anita Daimant’s The Last Days of Dogtown is a work of historical fiction based on a colonial settlement Massachusetts. fiction book about a murder in Dogtown, but also Anita Diamant’s fictional work The Last Days of Dogtown (you may have read her best-seller, The Red Tent) and Thomas Dresser’s Dogtown: A Village Lost in Time. After reading those books, I had to go see the place for myself. Dogtown is a 3,600-acre tract of juniper, bog, and granite with a beautiful reservoir at one end. Early settlers–really early, like the mid-1600s–put down roots in Dogtown, though it couldn’t have been easy among so much rock. A century later as many as 100 families lived in the Dogtown area. But after the Revolutionary War, people figured that fishing might be a better way to make a living than tilling around giant boulders. It’s surprising that it took them that long. By the early 1800s, Dogtown was deserted, but for a few impoverished widows who, like Tammy Younger, the “queen of the witches,” intimidated passersby enough to make them pay her to leave them alone. A few dogs remained, too, which according to some people is the reason for the area’s name. One thing that’s unnerving about Dogtown is that’s it’s rather hard to find your way around, giving the feeling that at any turn you could become hopelessly lost and eventually end up like Tammy and her warty friends. To explore Dogtown Commons, buy a detailed trail map at Toad Hall Books in Rockport or bookstores in Gloucester and bring along your GPS. You can also take a tour with an expert Seania McCarthy at Walk the Words. With a bit of looking, you can still find the holes that were the cellars of the first Dogtown homes. 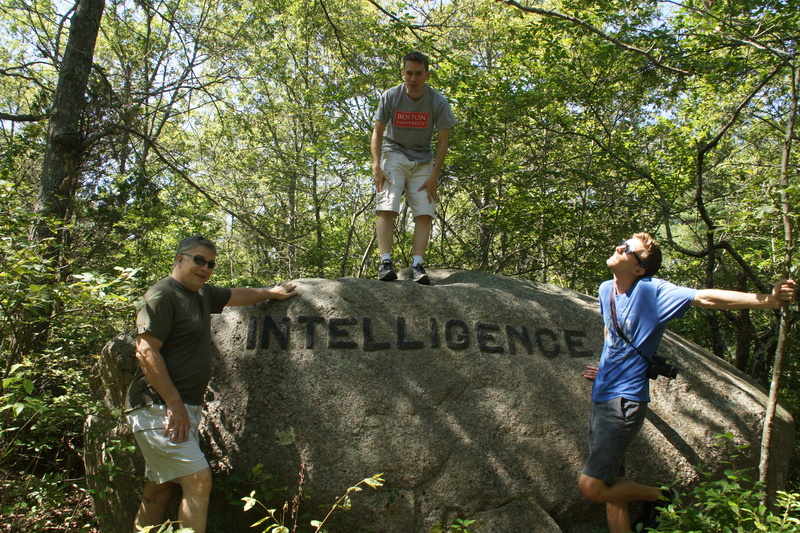 Intelligence gathering along the Babson Boulder Trail. All of this history and mystery made Dogtown a favorite source of inspiration for the painter Marsden Hartley who captured the place in powerful, primal paintings such as “Rock Doxology.” He said, “A sense of eeriness pervades all the place…. [It is] forsaken and majestically lovely, as if nature had at last formed one spot where she can live for herself alone.” Read the books and go see for yourself. 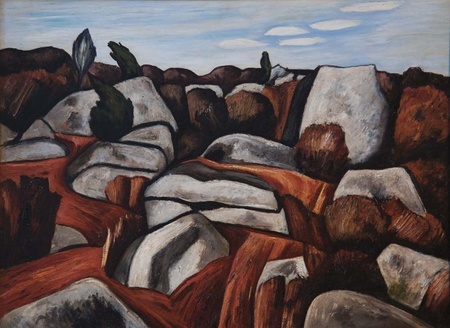 Dogtown was the subject of many works by painter Marsden Hartley. 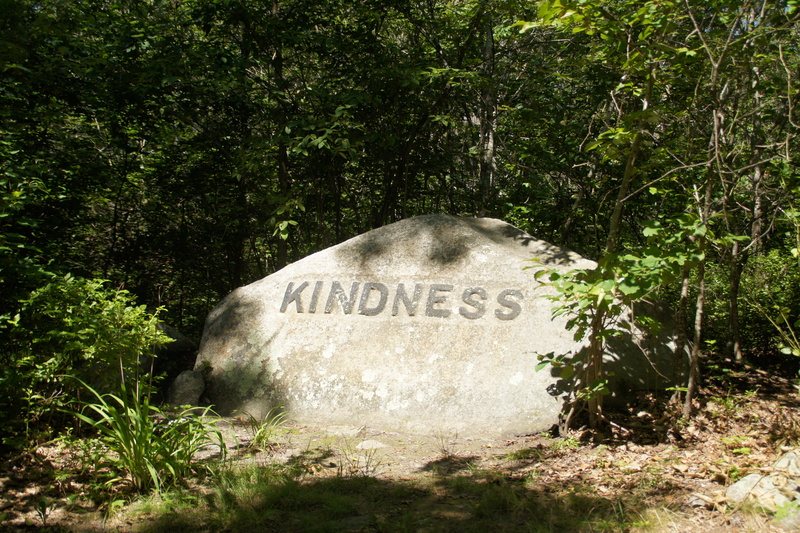 You can see “Rock Doxology” in the Cape Ann Museum, Gloucester, Mass.